'Free the Lands' • W. Jordan Republican lawmaker will join S. Carolina group pushing the message on the national stage. 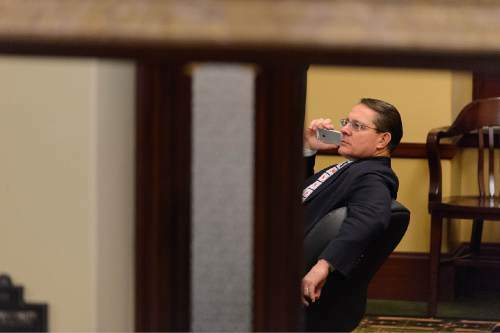 Trent Nelson | The Salt Lake Tribune Rep. Ken Ivory, West Jordan, takes a phone call on the last night of the Utah legislative session at the State Capitol Building in Salt Lake City, Thursday March 12, 2015. Al Hartmann | The Salt Lake Tribune Rep. Ken Ivory, R-West Jordan speaks in the House Government Operations Standing Committee Monday March 3 on SB005401, Elections Amendments. Rep. Jack Draxler, R-North Logan, chairman of the committee, left. The amended bill passed unananimously in the committee to bring it to the house floor. Many on the committee, like Ivory had reservations but voted for the so-called "Utah count my vote" compromise bill. This is an archived article that was published on sltrib.com in 2016, and information in the article may be outdated. It is provided only for personal research purposes and may not be reprinted. Utah lawmaker Ken Ivory is leaving his post as the American Lands Council&apos;s founding president to take his public-lands message to a national stage with Federalism in Action a South Carolina-based group affiliated with organizations funded by the Koch brothers and other donors pushing right-wing causes. 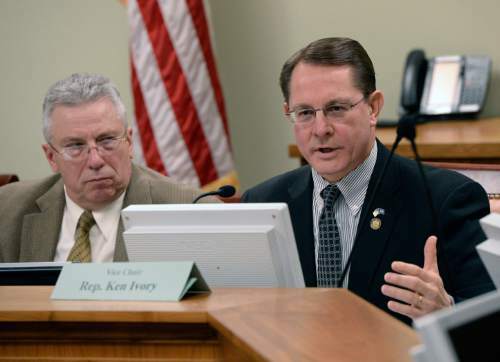 Ivory, a Republican representing West Jordan in the Utah House, sponsored the 2012 bill that orders the federal government to transfer title to 31 million acres of public land to the state. He helped launch the American Lands Council (ALC) that year in a so-far-unsuccessful effort to accomplish the law&apos;s goals. In that role, Ivory earned $135,000 in 2014, with most of the money coming as membership dues from rural counties around the West. He will be succeeded by Montana state Sen. Jennifer Fielder, a Republican representing Thompson Falls in the state&apos;s timbered northwest corner, according to a statement released Wednesday by the Utah-based ALC. A vocal critic of federal land management, Fielder has been leading the land-transfer charge in the Montana Legislature and has been a conspicuous spokeswoman for the cause. Last year, her Senate staffer William Macon Richardson resigned after Montana media disclosed he registered as a lobbyist for the ALC. The movement has not gained much traction in Montana. The Montana Legislature, which meets only during odd-numbered years, has turned down bills Fielder has sponsored that would lay groundwork for transferring public land to that state. No Western state has joined Utah in enacting a law similar to Utah&apos;s Transfer of Public Lands Act. Arizona&apos;s Legislature has twice passed similar bills, which were vetoed by two Republican governors. Utah lawmakers are weighing whether to sue the federal government in an effort take control of public lands within the state&apos;s borders. Outside legal consultants, who say the state has a strong case, estimated the cost of such a suit at $14 million. Critics contend Utah&apos;s claims to the land are weak and suing would be a waste of money and effort. Conservationists deeply oppose a land transfer, calling it a "land grab" intended to open the West&apos;s landscapes to development with minimal accountability to the public. In his new role, Ivory will lead Federalism in Action&apos;s new "Free the Lands" campaign. According to its website, Federalism in Action (FIA) is a 501(c)3 tax-exempt charity "promoting American federalism, liberty and fresh ideas aimed at limiting government. We seek to restore the proper balance between the federal government and the states  focusing on ways states can truly act as independent sovereigns and come up with local solutions." Ivory will continue serving as an unpaid member of the ALC&apos;s executive committee. On Wednesday, he released a mass email recruiting land-transfer sympathizers to head "local leadership teams" to spearhead the land-transfer cause at the grass-roots level, vetting candidates for public office and training neighbors to champion land transfer. "It&apos;s time, at the local, state, and national levels, to HIRE & INSPIRE REAL LEADERS with the KNOWLEDGE AND COURAGE to #FreeTheLands. These teams will be trained and tasked with spreading the message and building support for the #FreeTheLands movement one living room at a time, one neighborhood at a time, and one public official at a time," Ivory wrote. "Together, we must FIND LEADERS who will not forget that they, as the Declaration of Independence instructs, &apos;derive their just power from the consent of the governed.&apos; In our system of government, that means YOU are the boss! But, if you expect to be treated like the boss, YOU have to act like the boss!" The FIA was launched a few years ago by groups called State Policy Network and State Budget Solutions, which lists Ivory as a senior policy fellow. State Budget Solutions&apos; leadership recently joined the American Legislative Exchange Council, better known as ALEC. Remaining staffers are relaunching the FIA in partnership with the American Lands Council Foundation, according to a mass email sent by the FIA&apos;s executive vice president, Jonathan Haines. According to IRS filings, State Budget Solutions draws support from the Donors Capital Fund. This is a 509(a)3 organization known for cloaking the sources of its funding as it distributes money to various nonprofits. Ivory did not immediately response to email requests for comment concerning the FIA&apos;s funding sources.